A brand's video stories can go in countless directions now. But what strategies and channels are working now? 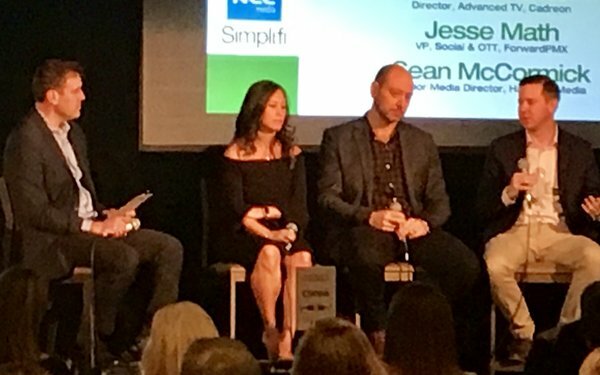 We open the TV and Video Insider Summit with practice rather than platitudes. We ask buyers and planners to pop the hoods on some of their most recent cross-screen campaigns to share what did and didn't work, How did they correct course and optimize? What were the biggest surprises and lessons learned? Let's start with what is possible now. Robert: Where do things sit? Sean:The challenge is that a lot of traditional clients want linear TV. They are uncomfortable with data targeting. Try to get them to look at it as a video plan, not a TV plan. Look at it holistically. Internally, we’re siloed. Who handles what, and how to divvy up video versus TV. Example: When people who run TV linear plans have specific dayparts, they want to know where the money is going. But programmatic digital is all over the place and they don’t care where. It’s funny. Jesse: From an OTT perspective, clients are saying, oh, what? We see the other side of the story: advertisers that are obsessive about digital buys and safety. Larene: Audience-first strategies, flipping the script and making a foundation about audience and then putting in traditional media on top of that to build reach. With linear, clients are used to seeing a schedule. That’s not how data-driven strategy works. Trying to get them to understand platform-agnostic as long as you reach the right person -- it doesn’t matter. Robert: Pop the hood on specific plans. Any specific cross-screen plans done recently? Larene: We have a CPG client that didn’t have a traditional TV plan, specific audience. How do we build a media mix? Creating a strategic target, adding filters, then understanding where those audiences consume media. One hiccup: addressable, OTT are on different currency -- we had to talk to the client about effective CPM. Some clients have an understanding, but others we educate to think differently. Move with the industry the way it’s going. Jesse: As a performance digital agency, measurement should be digital. I care about scale, but not about reach or frequency measurement. I care about outcomes. That’s how we’re measuring. Some things we can measure, and others are more tricky. Taking a geo-saturation approach, mix becomes the vehicle for driving the most lift you can get. It’s become a data-planning game. Digital to us is through a programmatic lens because it helps with data and measurement, to keep costs down. Sean: Attribution -- you have your DR, but what about top-of-the-funnel? Can it not be both? Awareness tactic or response-driven, or both at the same time? Robert: Can you talk specifics? Sean: With retail client, mostly in Walmart. Didn’t have a budget for national, and the competitor spends 10x as much on national. Let’s take your money and be smarter. Targeted smart buy. Pulled MRI, created a targeting segment, and hit spots that we think your competition isn’t. CPM will be a little higher. But hitting the right people -- it was successful. It's ongoing now and for past two years. Paired with a network buy recently, with bigger budget. ”We’re not seeing our spot.” That’s not the point. If the Walmart buyer wants to see it during an NCAA game, then we have to cater to the client. Delivered 100MM impressions. The ultimate goal -- it's more about optics. We felt we hit the right -- not necessarily the most -- eyeballs. Robert: How to allocate for screens? Jesse: It’s data planning for us. Deal directly with publishers where possible. The line between investing in upper-funnel and performance programs is more blurred than ever. Look at best campaigns of the year, the end of the case study ends in revenue increased X%. There are no good tools. Between YouTube, online video and connected TV, there is no good way to plan. Where to start? I don’t know if that’s answerable today. I'm happy to let my buys run across TV screens, desktop and mobile. Sean: It starts at MRI and comScore. If a client has a certain CRM, we use that -- try to find a target and go from that. Larene: We have developed our own proprietary data stack. We’re taking it all in with third-party data to inform client. Outcome-driven, how it affects business goal for that client. Creating algorithms and how does it deliver on sales goals? Robert: One of the biggest complaints is that we are poor at looking back and learning from the last ad campaign. Sean: It’s hard to match up with sales data sometimes. Larene: Feedback is not in real-time. How to optimize for the next campaign? It's hard because results come back six or eight weeks later. Jesse: It’s important not to look back at false negatives or false positives. Learnings have to be about channel and vehicle.